Andrew McDonald began his professional career as an investment analyst at ASIMCO, a Beijing-based private equity firm acquired by Bain Capital. In 1999, he returned to the U.S. to work directly underneath brokerage legend, John C. Cushman, III at Cushman Realty Corporation. In 2001, Cushman Realty Corporation merged with Cushman & Wakefield. At C&W, Mr. McDonald has been a perennial member of the Chairman’s Circle, an honor reserved for the company’s top producers. Mr. McDonald is a frequent guest lecturer at The Marshall School of Business at USC, and has been recognized in the Los Angeles Business Journal’s annual “Who’s Who in Los Angeles”, and Real Estate Southern California’s “40 under 40” list. 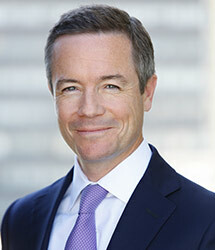 In addition to representing his own portfolio of clients, Mr. McDonald serves as the Market Leader for the Los Angeles operations of Cushman & Wakefield. Mr. McDonald currently serves on the Board of Directors of The Good Shepherd Center for Homeless Women and Children, and the Pasadena Southwest Little League. He is the immediate past Treasurer of the Los Angeles Commercial Realty Association. At Cushman & Wakefield, Mr. McDonald serves on the Executive Committee of the Investor Services Leasing Group and the Rising Leadership Council.